I talked recently about how easy it is to roast your own peppers. You might remember I even mentioned a few of the ways I like to use them in cooking, but today I’m sharing my current favourite thing to do with a roasted pepper: turn it into the incredible Syrian dip, muhammara. Muhammara, mouhammara or muhmmara (I couldn’t find consistency with spelling so I’ve gone with the one which feels most right), is a roasted red pepper and walnut dip hailing from Aleppo in Syria. Along with the roasted peppers and walnuts, the dip is flavoured with garlic, Aleppo pepper flakes and pomegranate molasses, and given body and texture with breadcrumbs. The ingredients are ground together into a smooth, thick and rich dip suitable for scooping onto flatbreads, or as a condiment to all sorts of grilled meats and vegetables. It’s savoury and deeply satisfying to eat, with just a hint of warmth from the Aleppo pepper (which is a fruity, milder type of chili pepper) and a unique sweet/sour undertone from the pomegranate molasses. 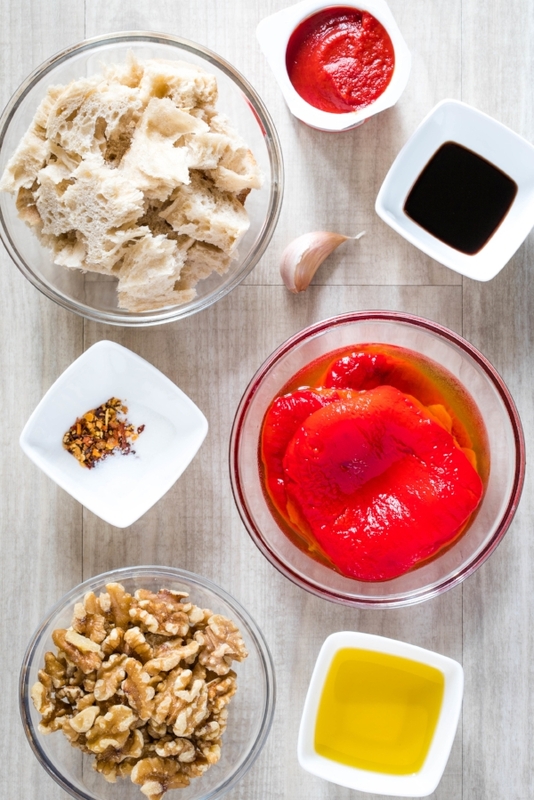 Although it’s got a couple of unusual ingredients, Muhammara is a really easy dish to put together because you just pop all the ingredients into a food processor and blend until smooth. If you don’t have a food processor you could make this using a mortar and pestle. The texture won’t be quite as uniform but given that I doubt whoever first made the dish had electricity, it’s probably going to be more authentic than my modern-day blended version! If you haven’t made, or even tasted, muhammara before, give it a try. It’s great as an appetiser for a crowd and is one of those dishes which might just become a staple once you discover how delicious and simple it is. Happy cooking, see you here again soon. Makes about 3 cups – enough for a large bowl of dip. This recipe was inspired by and adapted from one at The Mediterranean Dish. The Aleppo pepper and pomegranate molasses in this recipe can be a little hard to get hold of depending on where you live, but some good supermarkets carry them and they’re readily available online. If you’re buying them especially for this recipe, don’t worry about what you’ll use the leftover pepper or molasses for. Aleppo pepper can be used in any recipe where red pepper flakes are called for, and the pomegranate molasses is amazingly versatile – try it as a unique and delicious topping for ice cream, or as a slightly sweeter, fragrant substitute where you’d usually use balsamic vinegar in dressings and sauces. 1. Put all the ingredients into the bowl of a food processor and run it until you have a smooth, thick dip. Open the lid and taste – you may want to adjust your seasonings, adding a touch more salt or sugar, or some extra pomegranate molasses. If it’s too thick, add a little more olive oil. 2. Scoop the dip into a serving bowl and drizzle with extra oil, then sprinkled with chopped parsley and walnuts if you like. Serve immediately, or store, covered, in the fridge, for up to a couple of days. Bring the dip to room temperature before serving. Over to you – if you try this recipe I’d love to know about it! Please share your pictures with me on Facebook or tag @steamandbake on Instagram. Would you like more Steam and Bake recipes and cooking inspiration? Join the mailing list – there’s no spam, just an email every now and then to tell you the latest. When you sign up, you’ll get an invite to the exclusive subscribers-only Combi Steam Cooking Facebook group, which is full of people at all stages of their combi steam journeys, and with many different brands of oven. It’s a friendly, helpful space to learn and share with one another, and I’m always in there answering questions and sharing tips. And if you’re after more delicious dips and spreads, try my favourite roasted carrot hummus, or this bright spring-time inspired pea and broad bean crostini with whipped feta.